I'm pretty certain they just reused the model from Thrain to Dain. Guys. He isn't carrying a mattock in the film. A mattock is part hammer part pickaxe. Dain is carrying a warhammer. Thrain was carrying a mattock. They just mirrored the hammer component on Thrain's mattock to make Dain's warhammer. Anyway, the Red Axe designed by Weta is much cooler in my opinion. Personally I find the hammer cooler and more menacing, and it's in the movie, so I "have to" use it. (Even though I hate making hard surface objects). The axe could be used for a toggle though I guess... or a buyable upgrade. Yay, model is ready for painting! About the cape... anyone with rigging xp... Should I mimic the original (and narrower) cape, or is it safe to go all the way and expand into the wider cape in the movie, that covers the shoulders? Can the rigger rig part of the cape to the body and part to the cape bones? Edited by Nazgûl, 15 May 2015 - 07:36 PM. Make one of each, and see what looks best? Keeping the original will work, but the wide one from the film looks badass. It might pose problems though. Max, that was the answer I was hoping for! Now, the cape covers a LOT of the details, which is kinda.. meh! So, how about this... We let him start out without the cape, the helmet and the axe, using the hammer. Then we add a button called Royal Assets, or something... and when buying the upgrade, Dain gets the helmet, the cape and the axe, with increased armor, damage and Leadership? Cool? Edited by Nazgûl, 15 May 2015 - 07:35 PM. Sounds great! I'm totally here for hero-upgrades. It's fun to have the possibility to improve your hero's. Okay, Naz.. You are getting really good at the modelling. Now please, do your normal texture job in zbrush onto the model. But then, after you do your normal thingy-ma-jobs.. Enhance the texture.. With such an insane quality model it BEGS for a really high quality texture. 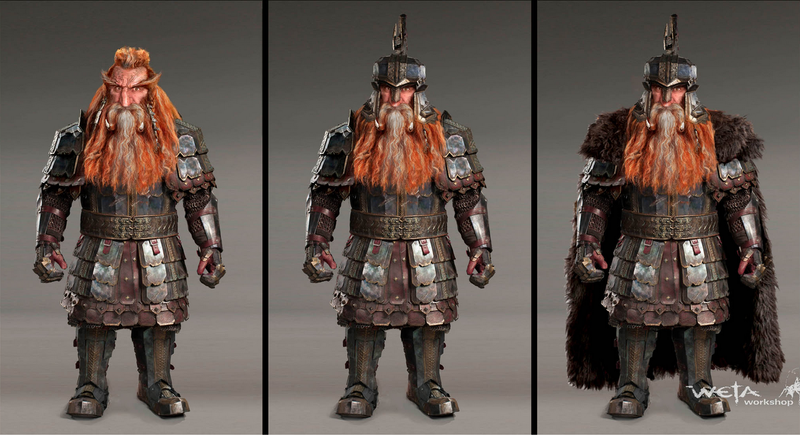 Hehe are you still refering to the Beorn model Kwen? I wish I knew why you don't like it (the texture). But my guess is that it's pretty simple. Beorn differs in many ways from the other models. He's "human", and has human caucasian skin. That makes us more critical, as we really know what caucasian skin looks like... Secondly, he has less defined muscles than for Azog and Bolg. With more fat on the body, you don't get see through skin with visible veins and you get less muscle definition that would create shadows and contours on the skin. Thirdly, he has no gear, armor or details like Bolg's metal parts, or Azog's decorations around the vaist... He has just normal, human caucasian skin, with some minor fat around the belly and vaist and some dirst stains. Not much you can do with that really, and he's painted the same way as other models. Then some splashes of whatever the skin tone might require to blend the colors into what we want. For white skin that would be yellow, pink and red, mixed with the base coats, shading and highlights of orange, brown and white... Anyways, I will try to polish the texture for Beorn a bit in Photoshop, by reducing intensity and add more shading. Edited by Nazgûl, 16 May 2015 - 12:04 AM.